Opening this weekend in theaters and IMAX is director Kenneth Branagh’s Jack Ryan: Shadow Recruit. 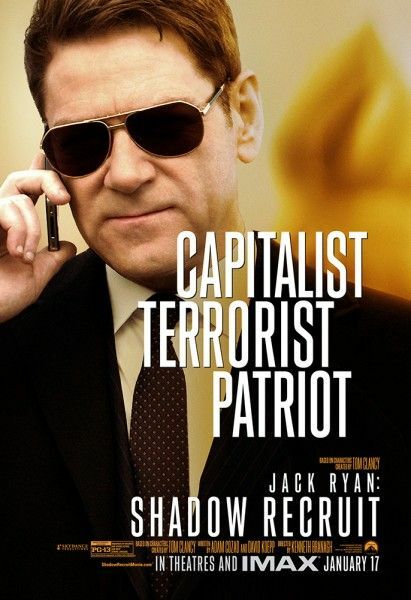 Based on the Tom Clancy character, the original story follows Jack Ryan (played by Chris Pine) as he uncovers a financial terrorist plot. Starring alongside Pine is Kevin Costner and Keira Knightley with Branagh as the film’s antagonist. A few days ago I got to talk to Branagh at the Los Angeles press day. He talked about how the script changed during production, whether he can get away with doing anything he wants in London given his celebrity status, the first cut of the film, deleted scenes, his editing process, what he collects, and more. Hit the jump to watch. Finally, if you missed any of my Jack Ryan set visit coverage, here’s my recap with a video blog, and on set interviews with Pine, Branagh, Costner, producer Lorenzo di Bonaventura, and producers David Barron and Mace Neufeld. When he’s filming a movie in London, can he literally do anything and the Government is cool with it? How long was his assembly cut? Also talks about his editing process. How did the script change during production?